We have been roasting Vittoria Coffee since 1958 and the brand is available all over the world. Vittoria Coffee is a global brand with registered trademarks in countries including New Zealand, USA, Singapore, South Korea, Canada, Fiji, Japan, Malaysia, Thailand and Philippines. 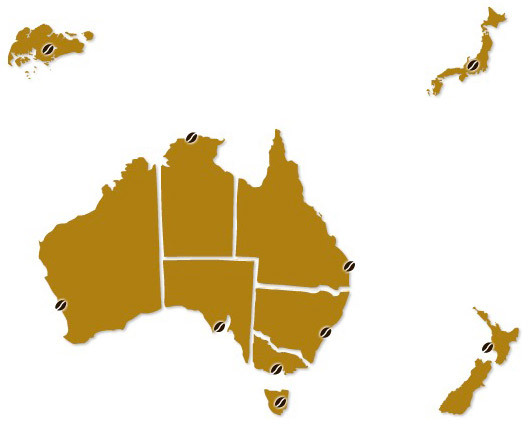 We have offices in Australia, New Zealand, Singapore and Japan that supply pure coffee, Santa Vittoria mineral water, soda's, iced teas, fruit nectars, Chocochino drinking chocolate and Gelatoria artisan style gelato to customers in over 15 countries. For any export related inquiries, please fill in the contact form below and a member of our Export team will contact you shortly.